The first work of fiction to be smuggled out of North Korea. Set during the period of Kim Il-sung and Kim Jong-il’s leadership, the seven stories that make up The Accusation give voice to people living under this most bizarre and horrifying of dictatorships. ...[a] remarkable collection ... In an unfussy translation by Deborah Smith, their power is in the plain-spoken, almost artless way they convey daily life under an ever-watchful, whimsically cruel regime ... In an unforgettable story about a deadly train-station stampede caused by Kim Il Sung’s entourage, 'Pandemonium,' an old woman marvels at the nonstop acting. Where else, she wonders, are cries of suffering 'wrenched from the mouths of its people and distorted into laughter?' This courageous book offers an important reminder that not all dystopias are invented. ...all the characters in The Accusation inhabit North Korea, and in these stories, as in life, no citizen is safe from the threat of political ruin ... In story after story, industrious North Koreans, 'innocent people whose lives consisted of doing as they were told,' accidentally run afoul of the state and lose their last political illusions. They then get jailed, escape, die, or go mad, but the real culmination of each story occurs in that instant of revelation, when they realise that, despite everything they have always been told, the state is malign ... Bandi’s prose style is rough, jagged with exclamation marks and anguished rhetorical questions: this, too, could be said to fit the exigencies of his book. If poetry, as Wordsworth said, can be glossed as powerful emotion recollected in tranquillity, The Accusation reads like powerful emotion felt right now, in a condition of ongoing crisis ... In its scope and courage, The Accusation is an act of great love. Bandi is a realistic writer, but from a twenty-first century Western perspective it may seem like he’s describing some dark fantasy set in Mordor, or a futuristic dystopia ... The stories, written between 1989 and 1995, constitute a passionate J’accuse: a political polemic written against North Korea’s communist dictatorship ... The stories make it painfully clear how awful life in North Korea is, with grinding poverty and an economy that at times seems little advanced from the Stone Age. Key themes are the family divided against itself, a world turned upside-down, and false appearance (or propaganda) vs. reality ... The Accusation is an angry book, composed in 'pure indignation,' but it shines a necessary light on what remains one of the darkest places on Earth. 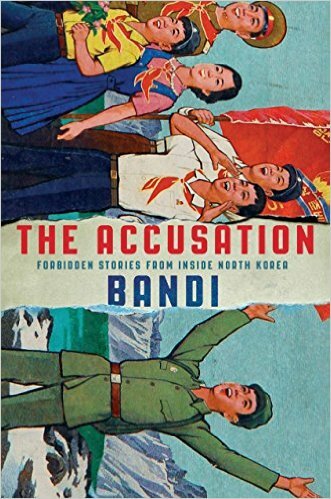 What did you think of The Accusation: Forbidden Stories from Inside North Korea?